Summer fun is water fun. 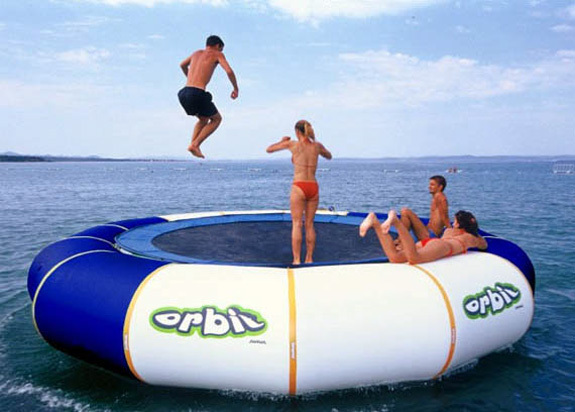 So to add some WOW factor to your water fun, we bring you two cool inflatable toys to bring with you to the beach, lake or swimming pool: a gigantic inflatable climbing iceberg and an inflatable trampoline. Ropes, crampons and harnesses. None of those items are required while attempting to scale the Gigantic Inflatable Climbing Iceberg , sold by oft overpriced purveyor of occasionally cool things Hammacher Schlemmer. This hunk of plastic — 14 feet high when fully inflated — floats above the water. Slip off it and you’ll have a soft, if splashy, landing. 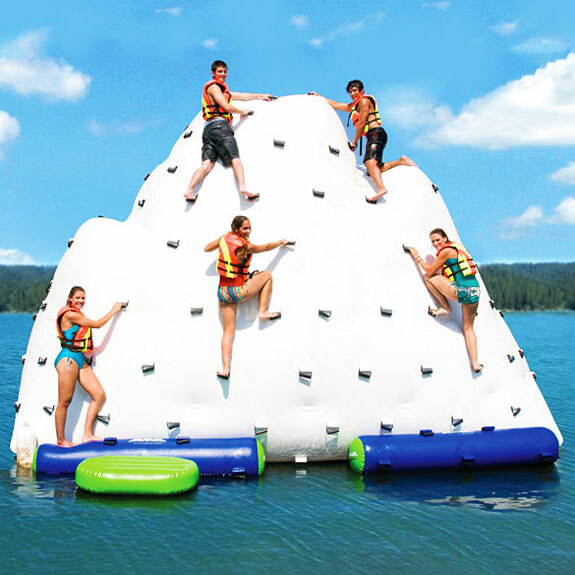 For true climbers, the Inflatable Climbing Iceberg will prove a poor substitute for a real, rocky experience. Those looking to upgrade their pool toy from, say, an inflatable chair, will be delighted. Spot Cool Stuff certainly wishes we had an Inflatable Climbing Iceberg in our younger days. Oh, the games of King of the Mountain we could have had with our friends! And many friends, at that — the Inflatable Climbing Iceberg can support 1,500 pounds, or enough weight for eight average-sized adults. 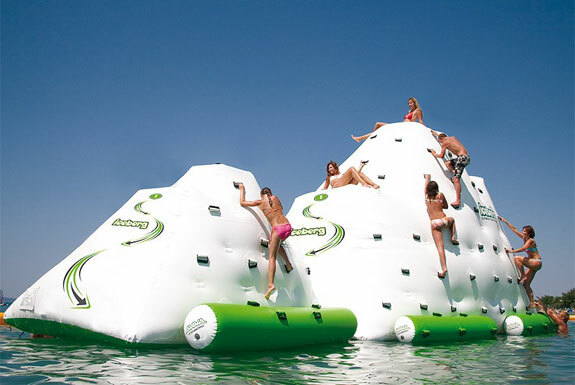 The Inflatable Climbing Iceberg can be deflated and inflated (with an electric pump) in 30 minutes. The manufacturer recommends putting it in at least 12 feet of water for safe use. Iceberg, dead ahead! Cheaper and more portable than the Gigantic Inflatable Climbing Iceberg (above) is an inflatable trampoline. We particularly like those made by Rave. While backyard trampolines are notoriously dangerous, over-water ones tend to be less risky (provided the jumpers are good swimmers and the trampoline is in deep enough water). 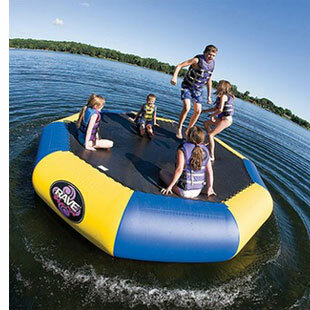 Inflatable trampolines don’t have the arm-catching coils and gaps around the edges that their land companions do. They also don’t tend to spring people as high in the air. And, of course, it is less painful (and more fun) to fall face first into the water than it is into hard ground. 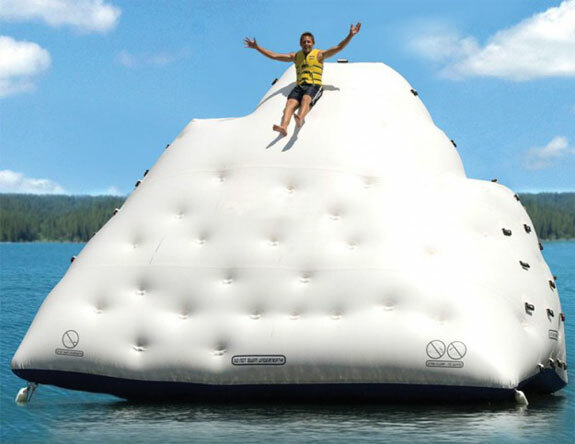 We also like how inflatable trampolines can double as floating island-ettes for swimmers to lounge upon. Available in a variety of sizes, from 9 to 25 feet in diameter. Get more cool pool toys online from ABC Distributing, Amazon.com and other sites. I know nothing about climbing, the powder bag they carry, isn’t it ruined in water? This looks as fun, of course it can’t substitute the real work-out, but is great anyway. I think I’ve seen something similar in Turkey.